Our 150W solar panel is the most powerful of the Sunshine Solar range for 12V battery charging if you are looking for faster power generation this solar module will deliver. 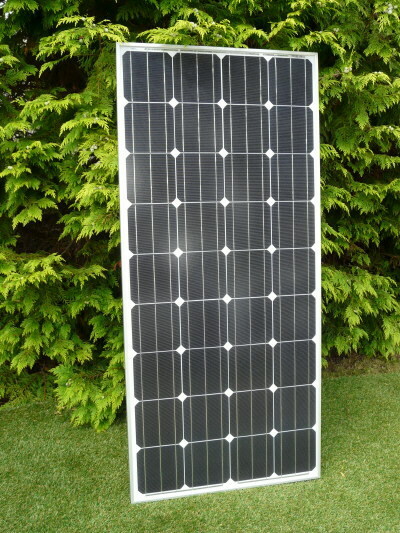 The high wattage output combined with high efficiency monocrystalline cells make this solar panel of particular interest for motorhome uses, static caravans, mobile homes, live aboard boats where larger power requirements are generally required. With a Sunshine 150W solar panel you could expect to generate around 42 amps per day when used in conjunction with a PWM solar charge controller and around 50 amps per day with an MPPT solar controller during the summer months. Multiple panels can be connected to acquire higher power if needed. Please Note: Multiple solar panels system will require a higher spec solar controller if you are unsure which you require or have any other questions please call 01508 488188 then Option 2 for Technical.